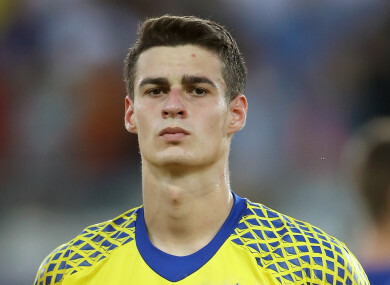 ATHLETIC BILBAO GOALKEEPER Kepa Arrizabalaga is set to join Chelsea for €80 million (£71.6 million), according to Spanish media reports on Tuesday. Sports daily Marca reported that Chelsea would meet the €80-million release clause in Kepa’s contract, beating the record transfer fee of €75 million, which Liverpool paid Roma for Brazilian Alisson earlier in the close season. “The British club have chosen Kepa as a replacement for Courtois, who in the next few hours will become a new Real Madrid player,” wrote Marca. Marca’s competitor AS said that “negotiations are very close to closing”. Catalan newspaper Mundo Deportivo also reported that Kepa would be signing for Maurizio Sarri’s Chelsea. Email “Chelsea to spend €80 million on Bilbao goalkeeper as Courtois replacement - reports”. Feedback on “Chelsea to spend €80 million on Bilbao goalkeeper as Courtois replacement - reports”.